In an era of changing animation, movies like Iron Giant, Titan A.E., Atlantis, and Treasure Planet were in style; sci-fi adventures utilizing new technologies and old stories. Warner Bros. tried its hand at the modernized genre, as an animation company that had only one success (Space Jam) but would go on to produce the Lego franchise of films fifteen years later. 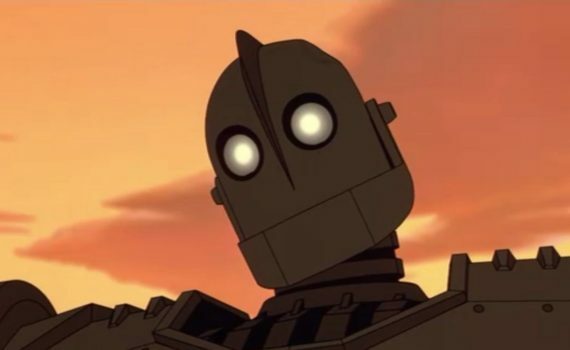 That they were able to create such a timeless hit like Iron Giant is a miracle, and took an entire team of very lucky people to pull off; the author of the original story, the writer of the screenplay, and the director of the film. Brad Bird would go on to do The Incredibles and Ratatouille, but he got his break here, with a movie that is as classic and American as apple pie, as strong a film as any animated great you set beside it. In the 1950s, the nightmare scenario of nuclear war with Russia had even school children on the edge of their seats, with adults planning for the very worst and wondering if every unusual activity was a sign of imminent doom. For Hogarth Hughes, life is one exciting mission after another; bringing home animals, wandering the woods, watching scary movies, and pretending that he’s the next great legendary hero. But when he stumbles upon an actual adventure, being heroic might be more than he bargained for. Hogarth finds a massive, metal-eating robot in the forest, one that doesn’t know why it’s here and doesn’t speak English. The unusual duo become fast friends, but there’s still the question of what to do with a giant when it’s time to go home. Government agents in town to investigate will cause even more trouble, and Hogarth will learn just how far his new friendship will stretch before it becomes dangerous. Iron Giant is a special film, that’s the simplest way to say it. Not many of this genre or of animated movies in general survive this long as a beloved story, or resonate this strongly even all these years later. The base morals are important ones; love overcoming fear, words overpowering guns, reason defeating war. Not all those ideals come true in our world, but in this story they can. This film captures the 50s perfectly, complete with Red Scare comics and Duck & Cover videos. It’s a blatant message, but a necessary one, and we need to hear it now more than ever. The movie itself is just so wonderful, from the unique animation to the one-of-a-kind characters. Vin Diesel is the voice of the Giant, coming off his first big role in Saving Private Ryan. Connick & Aniston are a great pair, the kid sells the plot perfectly, and the love between the boy and his robot is touching beyond what I can describe. Iron Giant is one of the best animated features that I have ever seen; if you haven’t watched it please remedy that immediately.